LEDBURY ST MICHAEL CHURCH, Herefordshire, (picture above) is dedicated to St Michael and All Angels. It is believed the site was first used during the 8th century when the Bishop of Hereford sent clergy to the town. A new church was built here in the 12th century in a Norman style with a chancel and nave. The beautifully carved and turreted west front creates a wonderful building. The tower was built in about 1230 separate from the church itself. This may have been as a defence from the Welsh or because a west end tower may have been to large to stand about an ancient stream passing through the site. In 1330 the Chapter House was built. Over the next hundred years, or so, higher arcades were constructed and the aisles were increased in width and height. The timber roof were built at this time. The inside of the church would have be radically altered during the Reformation of Henry VIII and made simpler and more plain. Musket shot damage can be seen in the old wooden doors of the north porch. This occured during the English Civil War when a battle took place in the nearby streets between Prince Rupert and the Roundhead General Massey. The grand spire was added to the tower in 1733A major restoration took place in Victorian times and general improvements were made during the 20th century. LEDBURY WESLEYAN CHAPEL in Herefordshire (picture left) was built in 1849. with seating for about 280 people. 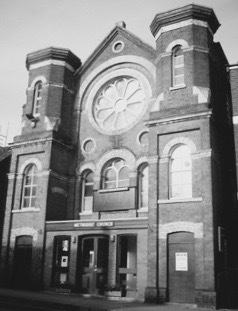 The front of the chapel was re-faced in 1884. The porch between the two towers was enclosed in the twentieth century. The list below shows a baptisms and a marriage that took place at Ledbury.